Scotland's deputy first minister has unveiled plans to cut energy bills by about 5% a year if the country votes for independence. 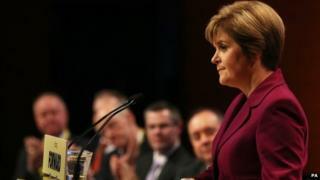 Nicola Sturgeon told the SNP's conference in Perth the reduction of about £70 would be achieved by removing a number of "green" charges. She believed the measure would not be a short-term fix, but a "real and lasting cut". People in Scotland vote in an independence referendum next year. On Thursday, 18 September, 2014, they will be asked the straight "yes/no" question: "Should Scotland be an independent country?" Ms Sturgeon explained that two schemes worth up to half of the green costs imposed on energy companies would be removed from the bills of consumers. The minister told the party's annual gathering: "Right now, the Scottish government invests around £80m a year on energy efficiency schemes to help meet our climate change targets and lower the costs of energy bills. "A further £120m comes from a scheme designed in Westminster, operated through energy companies and paid for by a levy on your gas and electricity bills. "It is a disjointed approach, it doesn't take account of Scottish priorities and it's not as efficient as it could be." Allocate "up to £20m" for a second year to help those affected by the spare room subsidy. Fund the Poverty Alliance to deliver a Living Wage Accreditation Scheme to "promote the living wage and increase the number of private companies that pay it". A White Paper on independence, to be published in November, to "answer all your questions". Cut energy bills by about 5% a year (about £70 per annum) by removing a number of "green" charges. Bring Scotland's postal service back into public hands. Abolish the so-called "bedroom tax". Protect the state pension and make sure it keeps pace with the cost of living. Remove Trident weapons from Faslane on the Clyde. Ms Sturgeon went on to announce that an SNP government in an independent Scotland would remove the energy saving measures and the warm home discount from energy bills. She said the current system would be replaced by a more joined-up approach with funding for fuel poverty schemes - worth up to £200m per year - coming directly from government. Ms Sturgeon added: "Independence will allow us to tackle fuel poverty much more directly, delivering Scottish solutions to Scottish problems, and ensuring that energy companies always behave in a socially responsible way to protect vulnerable customers." She insisted the energy schemes would be delivered more effectively and it would save hard-pressed consumers money. The SNP deputy leader told the conference: "We estimate that it will cut energy bills by around 5% - or £70 a year. "Not a short-term measure - but a real and lasting cut in Scottish energy bills." The minister went on to demand that the coalition government at Westminster ditch its spare room subsidy, which is described by critics as the ''bedroom tax''. But she said if it refused to act, the current Scottish government would allocate "up to £20m" for a second year to help those who have been affected. Ms Sturgeon also announced that the Holyrood administration would fund the Poverty Alliance to deliver a Living Wage Accreditation Scheme to "promote the living wage and increase the number of private companies that pay it". Turning to the issue of health, Ms Sturgeon said a UK-wide approach "would be the worst thing that could ever happen to the Scottish NHS". She added: "Westminster privatisation of the NHS is not wanted in Scotland. "Scotland's national health service is staying in public hands." Ms Sturgeon went on to warn that Westminster MPs in all the UK parties were "itching to abolish the Barnett formula and cut Scotland's share of spending". She said: "So, I say this to everyone yet to make up their mind [on independence]. Consider carefully the arguments for a Yes vote. Subject them to scrutiny and ask the tough questions. "But do not ever let anyone pull the wool over your eyes about the consequences of a No vote. "They are clear and they are real. Scotland's social security system will be dismantled; Scotland's public services and universal benefits will be under threat and Scotland's budget will be cut. "The risks of a No vote are real." Ms Sturgeon promised that the Scottish government's White Paper on independence, which is due to be published next month, would "answer all your questions". She added: "The White Paper will be Scotland's detailed guide to independence. "It will make the positive case. It will explain the process by which we will become independent and describe how our newly independent country will work. "It will set out the gains of independence for you, your family and for your community." Towards the end of her speech, Ms Sturgeon said: "The vote in 2014 is not a vote for or against the SNP. "It is a vote for or against the power to take decisions in Scotland." She insisted that an SNP government after independence would bring the mail service back into public ownership; reverse welfare reforms; protect state pensions and get rid of Trident nuclear weapons.